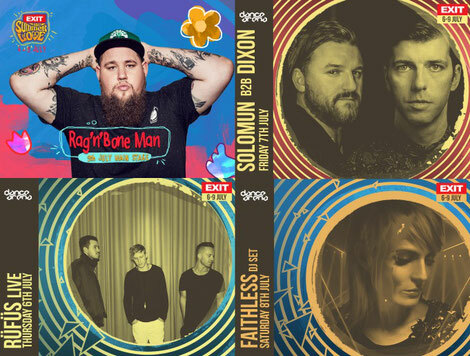 EXIT Festival recently revealed the second wave of acts set to perform at this year's edition, which takes place from 6-9 July 2017, in Serbia. British soul musician Rag’n’Bone Man is heading to Exit Main Stage on Sunday 9 July. Author of one of the biggest hits in the world at the moment, ‘Human’, audiences and critics alike have apparently been won over by the combination of his deep voice, sincere lyrics and raw emotion. Having already won this year’s BRIT award in the Critics’ Choice category and been nominated in the British Breakthrough Act category, not to mention one of the Sony's executives stating that ‘Human’, out on 10 February, will be one of the best-selling albums of the year, many see 2017 as Rag’n’Bone Man’s year. The Exit Festival is just a short ride away from the Serbian capital Belgrade. Held at the Petrovaradin Fortress set high on the banks of the river Danube in Novi Sad,it provides the perfect setting. Started as a student protest in 2000 fighting for political change and freedom, EXIT continues to spread positive vibes, promoting change and positive education, supporting many community and humanitarian missions, while throwing a party. The award winning festival has something for music lovers of all genres with a diverse mix of artists performing on numerous stages connected by cobbled streets, ramparts and tunnels.